Priceline up to 7% Rebate Priceline Last-Minute Cruises up to 75% off from $60/ night! 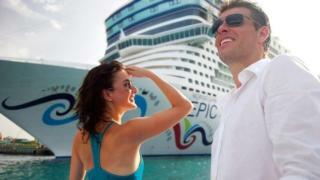 Priceline up to 7% Rebate Priceline Caribbean cruise deals from $169! CruiseDirect up to 3% Rebate Check out CruiseDirect's last minute cruise deals, selected by CruiseDirect's expert staff. to commit to any one place. If in fact you determine there is one place you like best you may plan a return trip to explore it in more depth. Once you’ve selected a cruise ship and itinerary, the important vacation decisions are complete. So even the vacation planner can board the ship and relax. There are no hotels to book, no transportation to figure out, no decisions on where to go, what to eat or what to do. Best of all you unpack only once! A cruise vacation can be a great value for your dollar and because you will know the cost of your trip ahead of time, it makes budgeting easier. With the three largest travel expenses - accommodations, food and entertainment - included, you won’t be counting your pennies while on vacation which means less stress. Despite some cruise "extras" that come with a price, many of those can be avoided if you are truly on a budget. In fact, most travelers spend less money on a cruise than if they travel by land. In addition to the many places you’ll see, there’s a variety of things to do between ports. If basking in the sun is not one of your favorite things to do, you’ll find limitless deck activities. Enjoy surfing at sea, rock climbing, zip-line, dodge ball, basketball, mini-golf or Bingo. Find time to work out in the onboard gym or rejuvenate at the spa. Learn something new – language, cooking or dance class, pottery, scrapbooking or napkin folding. Enjoy pre-dinner live music performances in a variety of styles around the ship. Post dinner, catch a movie under the stars, a Broadway show or hit the casino. And let’s not forget the kids. Cruise lines have elaborate kids' recreation areas. Think mocktail bars for sodas and smoothies, Internet and video game consoles, piles of board games and toys, hands-on crafts projects, ship-wide scavenger hunts, pizza parties, karaoke contests and more. Sunset and sunrise are two of the most beautiful sights in nature. Grab a loved one's hand, along with your morning java or favorite cocktail, walk over to the ship's railing and take a deep breath. You may have seen it before, but watching the sunrise or sunset over the ocean never fails to give you that, "I'm on vacation, and life is good" moment. If you’re not already convinced, we’ll make it even easier by offering cash back rewards and discount deals when you book your cruise through RebateBlast. So what are you waiting for? Anchors Aweigh!